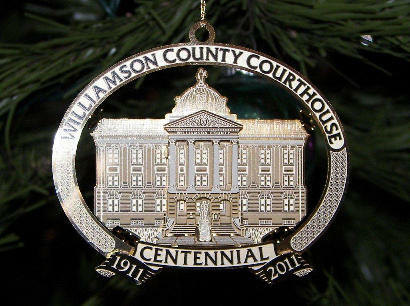 Williamson County Courthouse, Georgetown Texas. In 1851, the county purchased a one-story, 14 x 30 foot, wood frame home with a gabled roof from William Patterson for $390. The home was just off the square on the same block as the log courthouse and it was used as the county�s second courthouse until 1857 when the third courthouse was constructed on the square. The third courthouse was a 50 foot square, two-story rubble limestone building with 2 feet thick walls and a hipped roof and it was the first known stone building built in town. Joseph S. Williams was paid $5 for the plans but he may not have been the architect. Construction of this building was poor and it had to be repaired before it was even completed. In 1873, four iron rods that were the length of the building had to be installed to stabilize the structure. 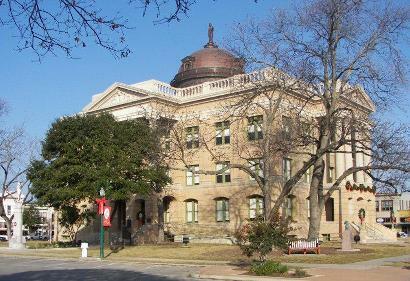 In 1877, Austin architect Frederick E. Ruffini and his architectural partner Jasper N. Preston were hired to design the county�s fourth courthouse. 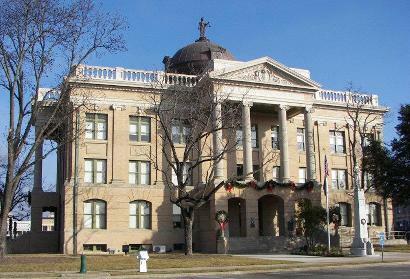 Ruffini, with his brother Oscar, designed over a dozen courthouses in Texas in the late 19th century. 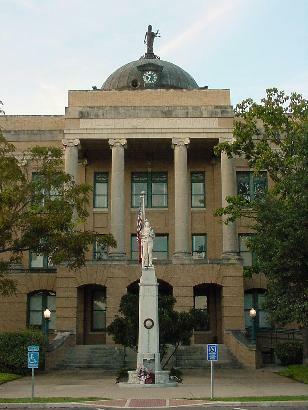 Ruffini also worked with Preston in 1878-79 on the former McCulloch and Gregg County courthouses and again in 1883 when the Bastrop County courthouse was built. 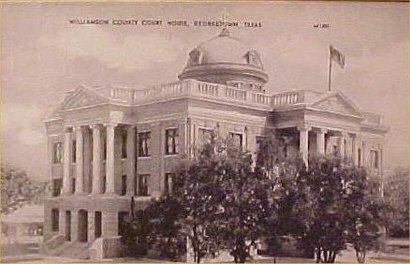 Preston would later go on to design the Bell County courthouse and the former Washington County courthouse, both in 1884 and the former Mitchell County courthouse (with Ruffini) in 1885, which was a copy of the Bastrop County courthouse. 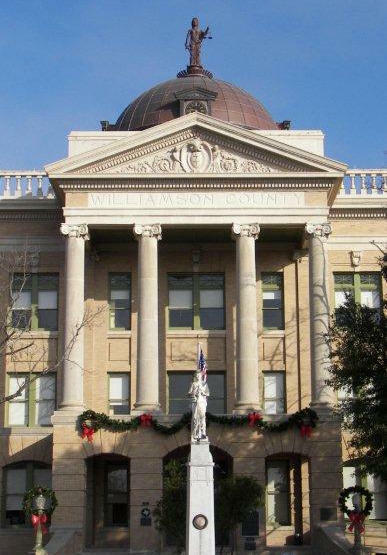 The contractor of the fourth Williamson County courthouse was John Didelot and the cost of construction was $27,400. It was a grand three-story Second Empire style building of stone with pediments, roof cresting, an elaborate cornice, corner pavilions with Mansard cupolas and a large rounded cupola over the front entrance. 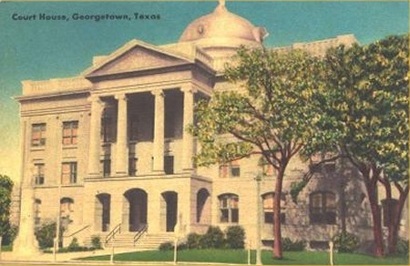 Completed in 1878, the fourth courthouse was nearly identical to the 1882 Hays County courthouse (designed by Ruffini, which burned down in 1908) and the 1882 Robertson County courthouse (also designed by Ruffini, which still stands today, but in altered form.) 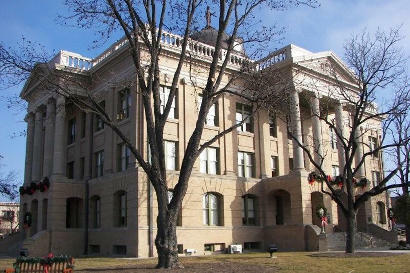 In 1909, the fourth courthouse was deemed no longer safe and plans were made to fund the construction of a new courthouse. The fifth and current courthouse was designed by Austin architect Charles Henry Page of the C.H Page & Bro. architectural firm. 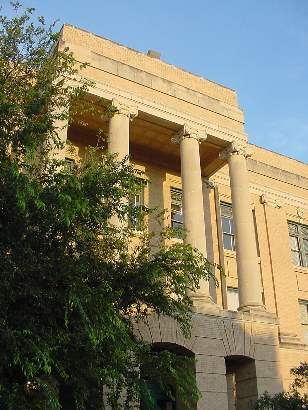 The Page Brothers firm designed almost a dozen courthouses in Texas built between 1908 and 1937. The contractor was W.C. Whitney of Beaumont and the cost of construction was nearly $120,000. The cornerstone was laid in 1910 and construction was completed in 1911. The three-story buff brick building with terra cotta and limestone details was built in the Beaux-Arts style with extended porticos on each side with triple-arched entrances. Two-story Ionic columns support decorative pediments, pilasters with Ionic capitals separate each bay of windows and a balustrade surrounds the roof. 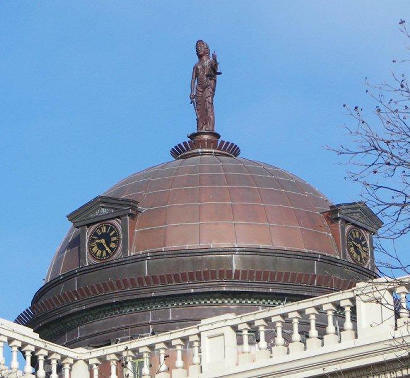 A copper dome with clocks on each side sits in the center of the roof with a blindfolded statue of Themis on top holding scales and a sword. 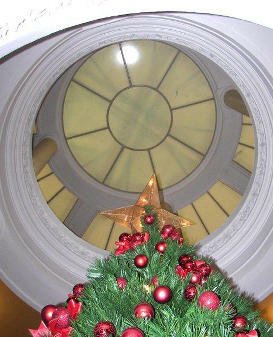 This courthouse received many interior alterations over the years, including resurfacing the floors, removing of one of the spiral staircases in the rotunda to install an elevator and dropping the ceiling in the district courtroom, eliminating the upper balcony. 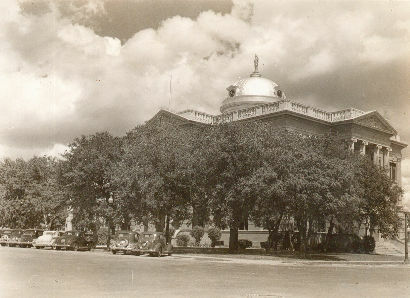 Postcard view of the courthouse before the 1965-66 alterations. The exterior was altered in 1965-66 after terra cotta from the roof balustrade began to crumble and fall off the building. The balustrade and pediments were removed, replaced by a wall of brick and stone that surrounded the building. 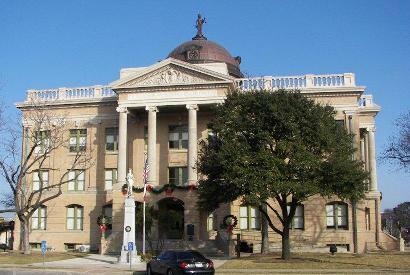 In 2000, the county received funding from the Texas Historical Commission to create plans for a full historical restoration and a construction grant of nearly $4 million was awarded to the county in 2004. On the exterior, the balustrades and pediments were reconstructed and the dome was replaced. 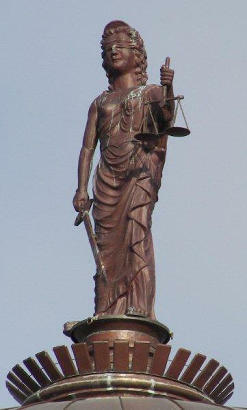 The statue of Themis was also removed and restored. 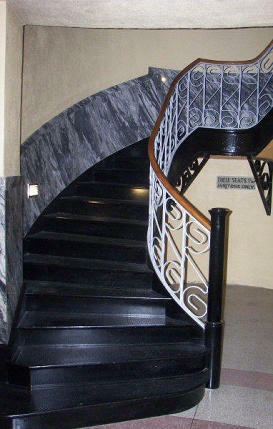 On the interior, the terrazzo floors were reconstructed along with the spiral staircase and the elevator was relocated. 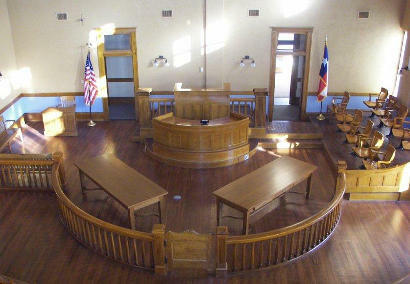 The original paint scheme on the walls was restored along with the county courtroom and the balcony in the district courtroom. 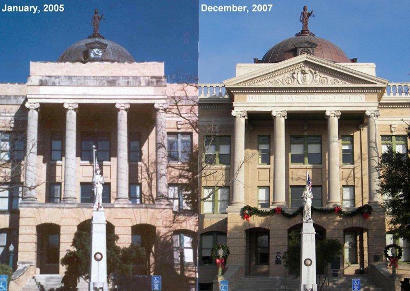 The restoration was completed and the courthouse was rededicated on December 8, 2007. County history and biographical information from The Handbook of Texas Online. 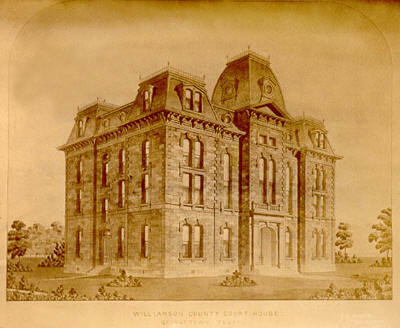 Courthouse information from The Texas Historical Commission�s County Atlas at http://atlas.thc.state.tx.us/shell-desig.htm National Register of Historic Places: Williamson County Courthouse Historical District, The Williamson County Historical Commission at http://www.williamson-county-historical-commission.org/ and Courthouses of Williamson County � Historical Narrative by Clara S. Scarbrough, 1980. 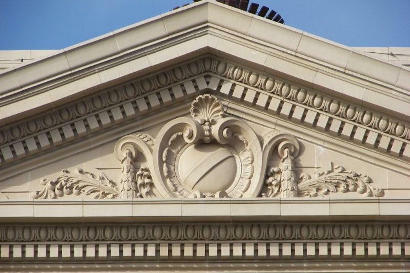 Detail on the East side (identical to the West side) pediment. 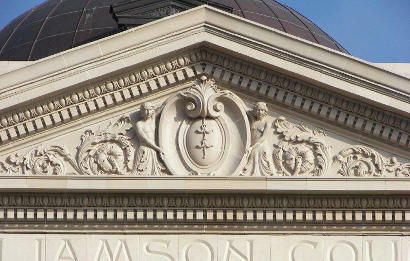 Detail on the South side (identical to the North side) pediment. This staircase in the southwest corner of the rotunda was completely restored. 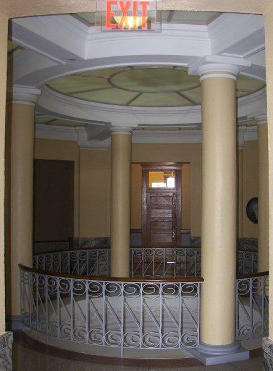 It had been removed during an earlier interior remodel, leaving only one staircase in the rotunda. A painted sign on the wall beneath the staircase reading "THESE SEATS FOR JANITORS ONLY" was uncovered during the restoration. The skylight seen from the top floor. 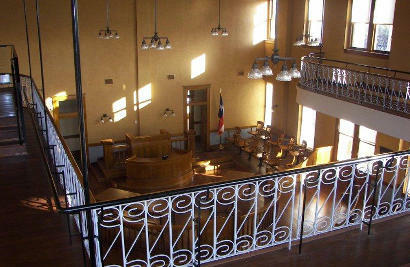 The two story district courtroom has been faithfully restored including the upper, wrap-around balcony.